Iraq’s extensive reservoir network is at the heart of the country’s ability to manage its available water resources. The dams are operated in three independent systems: System No. 1 encompassing the Euphrates, Tigris, Greater Zab and Lesser Zab; System No. 2 encompassing the al-Adhaim watershed; and System No. 3 encompassing the Diyala watershed. Each system is operated to manage the water distribution to municipal, industrial, agricultural and environmental users and to provide downstream flood hazard protection. Map 6. Reservoir management systems. Despite the construction of dams in Turkey and Syria, it is still possible for flood events to occur in Iraq, particularly along the tributaries to the Tigris River such as the Greater Zab, which is the last undammed large river in Iraq. Some of the other smaller eastern tributaries also lack flood control infrastructure and are known to experience flash flood events. Presently, flood peaks are managed using the storage capacity of on-stream dams and barrages as well as some off-stream topographic depressions. The Tigris is regulated by Mosul Dam and Dokan Dam on the Lesser Zab (a tributary to the Tigris) and Samarra Barrage. In case of extreme events where the Mosul and Dokan dams are not able to reduce flood peaks to acceptable values for the Baghdad reach, Samarra Barrage is the next point downstream that can manage flows coming from the upstream reservoirs (in addition to flows entering from the Greater Zab), and can divert water to Tharthar Lake. Haditha Dam and Ramadi Barrage regulate flows on the Euphrates. Ramadi Barrage can divert flows from the Euphrates to Habbaniyah Lake, and al-Majarra canal conveys flows from Habbaniyah Lake to Razzazza Lake in the event of large flood events. Derbendikhan Dam, on the Diyala, is similarly regulated, attenuating floods in order to protect Baghdad. 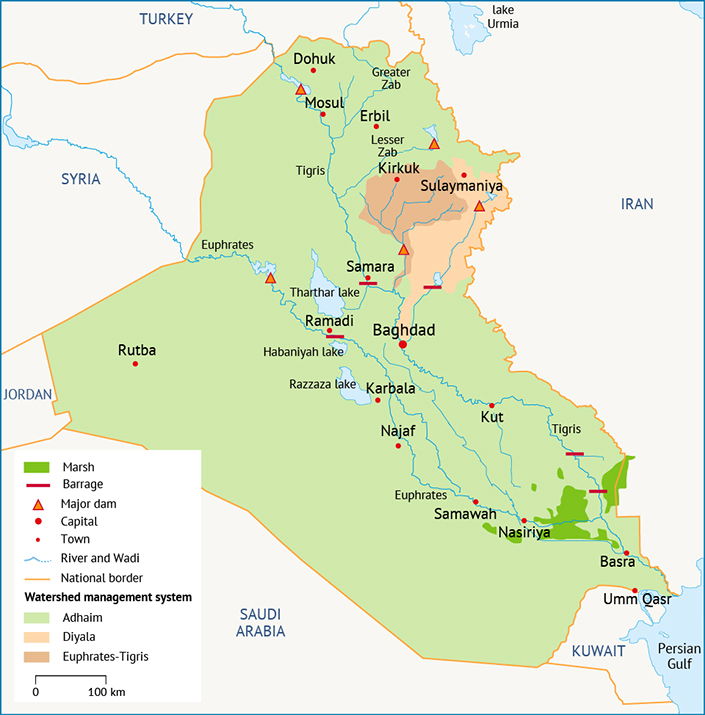 The Diyala flows into the Tigris just downstream of Baghdad; due to a backwater effect, simultaneous floods on the Tigris and Diyala could pose a flooding risk to Baghdad. In the upstream part of the Diyala, Derbendikhan Dam regulates the flow on the river. The normal operation rules of the dam can be over-ruled to store more water behind the dam and prevent floods from reaching Baghdad. Mosul Dam, which is a significant multipurpose dam that provides hydropower and conservation benefits, presently poses a significant flood threat. The dam is currently operated at a reduced storage level due to concerns about instability of its gypsum foundation. Operating the dam at a reduced storage level reduces, but does not eliminate, the flood hazard. It is understood that there is consensus within the government that rehabilitation of Mosul Dam is a top priority. The rehabilitation of the dam will result in greater storage capacity, as it currently operates at a maximum elevation of 319 metres above mean sea level, instead of at the maximum operating level within its design, 330 metres above mean sea level. Once a solution to this problem is implemented, it will be possible to increase the water stored in the dam’s reservoir by over 50% compared to the present situation, thereby augmenting Iraq’s freshwater storage capacity by almost 3.8 billion cubic metres (BCM).